« Older: Editorial: Who is responsible for the stories published in The San Pedro Sun? The Mayor of San Pedro Town Daniel Guerrero is back on the island after leading a Belizean delegation to Taiwan on a 10-day working visit. Forming a part of the Belize delegation were Herbert Haylock, President of Belize Tourism Industry Association (BTIA), Israel Marin of Belize Diesel and Equipment Company Limited, Khub Chand Vanjani, a Director at the Corozal Free Zone and Marilyn Suzette Pinelo from the Belize Chamber of Commerce and Industry. The visit was an invitation from the Taiwanese government coordinated through the Central America Trade Office (CATO) in Taiwan. The delegation of five departed Belize on Friday April 19th and returned on Sunday April 28th. Speaking with The San Pedro Sun following his visit, Mayor Guerrero said that trip was a learning experience and one that can yield good results. 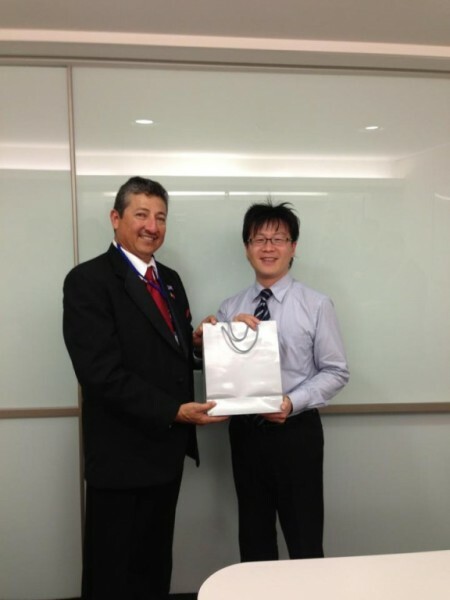 “I can see Belize benefiting from several things that the Taiwanese are doing. They are far more developed than we are but I am certain that in the area of investment, Belize can do more to attract some into the country. Recycling is another area we can learn from and capitalize. We are not good at recycling and if you look at Taiwan, they try to recycle as much as they can to reduce garbage. Tourism is another area we should try to invest more into,” said Guerrero. In Taiwan, the Belize contingency got to meet with key players in the business and commercial sector, as well as tour various places of interest. As part of the working visit, the group of five visited the Taiwan External Trade Development Center, Department of Investment Services, China Productive Center, Chinese National Association of Industry and Commerce, Chinese Professional Management Association, King Car Aquaculture Research Center for shrimp farming, King Car Horticulture Department, Port of Kaohsiung, Corporate Synergy Development Center and the King Car Whiskey Distillery amongst others. “It was a very tight agenda, but one that was certainly worth it,” said Mayor Guerrero. The delegation was also invited to visit key attractions in various parts of Taiwan such as the Ecological Orchid Garden, Pekin Opera, Kaohsing High Speed Rail, Giftionary Taipei 2013, Shilin Night Market, Taiwan Handicraft Center, National Palace and the Presidential Palace. Mayor Guerrero explained that one of the things that interested him the most was the solar powered public lights. According to the Mayor, it certainly something the council will try to consider for the island. Belize established diplomatic relationship with Taiwan in 1984. San Pedro Town benefited from this relationship in March when the Taiwanese government donated two garbage compactors to the San Pedro Town Council. The trucks are used as part of the fleet for garbage collection. During the handing over of the two garbage compactors Ambassador David Wu was presented with the keys to Ambergris Caye by Mayor Guerrero as a goodwill gesture.